Chart Wealth... Real Market Charts, Real Market Analysis! August 2005, Volume 2 Issue 8 Know It - Profit! 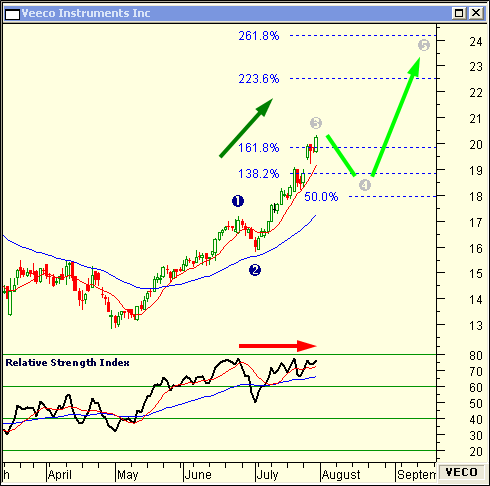 This month we'll look at the strong move by the Semiconductor support sector. But first... a major index is making new highs! All the major indices are in positive territory. 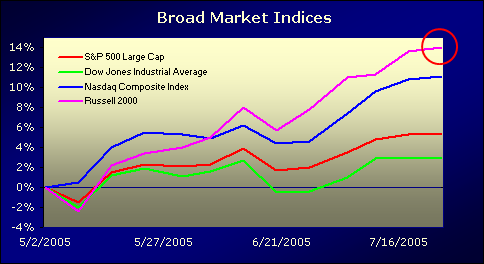 The Nasdaq Composite and Standard & Poor's 500 continue to outperform the Dow Jones Industrial Average. They are up 11, 5 and 3 percent, respectively. The Russell 2000 is up an impressive 14 percent for the three-month period. On this weekly chart, the Russell 2000 has broken-out to an all-time high! If we use the October 2002 low and the April 2004 high, we can project a Fibonacci third-wave extension into the 720-780 price range. Also, the index price and Relative Strength Index 9SMA-45EMA moving average cross-overs are in agreement... confirming the strength of the trend and the likely move to the target zone. The beauty of the relative price comparison method is it reveals the strongest sectors with great clarity... catching the rotation into and out of sectors right as they begin. This month a handful of new sectors have pushed to the forefront. 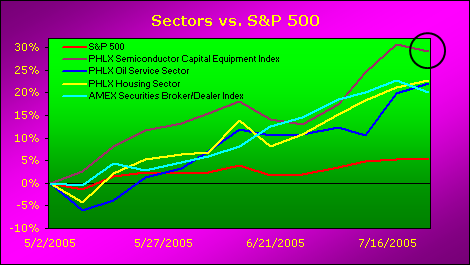 The PHLX Semiconductor Capital Equipment Index, PHLX Housing Sector, PHLX Oil Service Sector and AMEX Securities Broker/Dealer Index have made strong gains ranging from 20-30 percent. 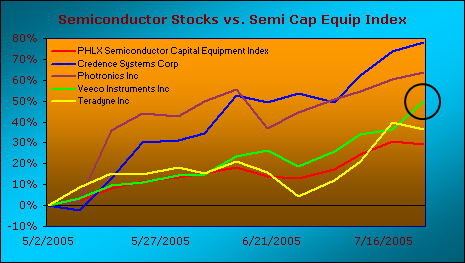 The sharp increase in the Semiconductor Capital Equipment Index may be signaling the beginning of a new tech rally. Credence Systems Corp, which services semiconductor test and diagnostic systems, is up a staggering 78 percent for the period. Photronics Inc is ahead an impressive 64 percent. They produce photo masks for semiconductor and microelectronic applications. Also, Teradyne Inc has pocketed a solid 36 percent gain. Veeco Instruments Inc (VECO) is up 50 percent for the quarter! What's driving these stellar gains? Currently, VECO is trading in the third wave target area. This zone is calculated by projecting a 138-162 percent Fibonacci extension zone from the end of wave one. Also, divergence between price and the Relative Strength Index (RSI) is evidence the third wave has been reached. Once the third wave is confirmed, expect at least a 50 percent Fibonacci retracement for the fourth wave before the price will begin to head into the fifth wave 223-261 percent Fibonacci extension zone. Finally, since the 9SMA-45EMA of price and RSI are in agreement, the trend should continue... propelling VECO to a $23 short-term high. 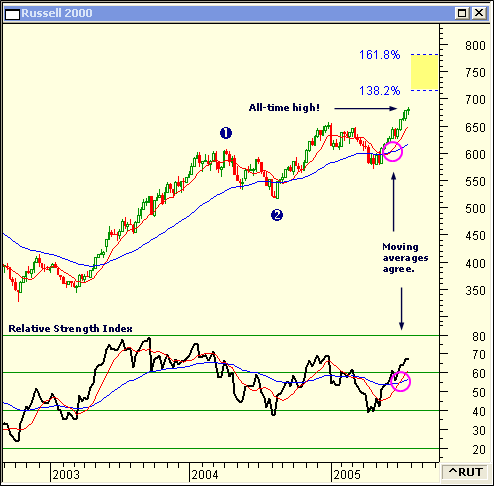 In the June 2005 issue of Chart Wealth, Equity Lifestyle Properties Inc (ELS) (View Chart) had reached a Wave III top and was due to correct down. It turns out, the third wave continued into the 223-261 percent Fibonacci extension zone... what I was calling the fifth wave target zone! When this happens, we need to re-calculate the Wave V target zone by projecting a 138-162 Fibonacci extension from the end of Wave III. The new price target will put ELS in the $47 to $49 zone. There are some lessons to be gained from this month's Where Are They, Now? Don't be greedy! Take partial profits when the market errors in your favor. And... be ready for the inevitable -- when the market moves against you, tighten stops and prepare for an early exit!